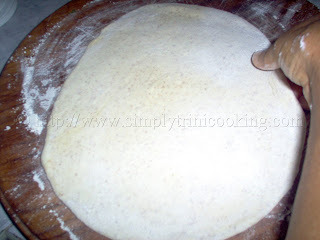 Buss up Shut or Paratha Roti is the third type of roti that I’m posting for you all. This, in my opinion, is the most favoured among the four types of roti, probably because Dhal puri (the fourth roti ) has too much work involved and the other two, Sada and Dosti, are generally eaten for breakfast or dinner. But Buss up Shut, is the one used for weddings and special occasions in Trinidad and Tobago. Although the popular belief is that, to enjoy a good buss up shut you have to go to an Indian Wedding, this has changed; now you can enjoy a hot, silky, buss up shut at any kind of wedding, christening or birthday party. That just goes to show how much we Trinidadians love buss up shut or is it that we don’t like to cook sometimes? I remember last “Arrival Day” (celebrated May 30th) every roti shop was busy (it didn’t have place to stand up) and there was a long line of people waiting to order buss up shut with a long list of sides (bodi, pumpkin, ochro, curry chicken, curry goat, curry shrimp, curry mango…you name it ,well… not curry beef ). But wait, if I could talk about the long lines then I had to be in the line also ….hmmm.. 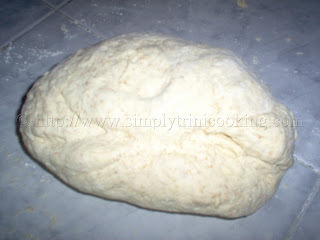 Anyhow back to the post, buss up shut is simple to make with common ingredients in any kitchen. 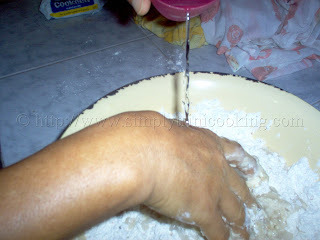 Once you learn the technique, people may wonder where in Trinidad you’re from but you could keep it a secret and don’t say I showed you how to make it real Trini style. All you have to do now is learn how to make Curry Chicken and Channa and Aloo and you could open a roti shop somewhere in New York and “yuh in bizness” haha!!!. 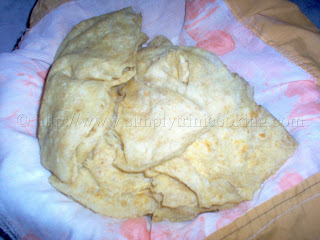 Here’s Buss up Shut or Paratha Roti. 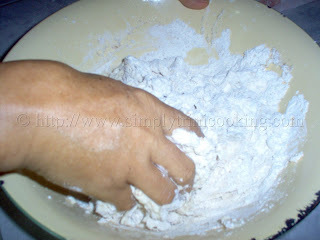 Sift and mix the flour, baking powder and salt. Add enough of water. 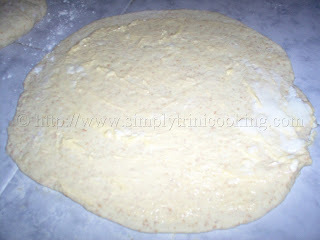 A soft dough is formed. Form four loyas or balls and leave to “rest” for about 15 – 30 mins. 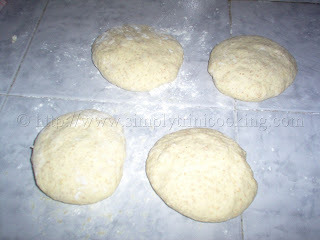 Roll out the dough after “resting”. the flat edge of the cup, then turn over onto the other side to cook. Spread butter or ghee on the other side the same way. 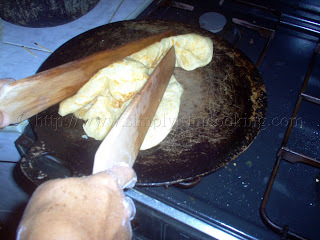 When cooked on both sides use a dabla to break up the roti to give the ripped up, flaky appearance. 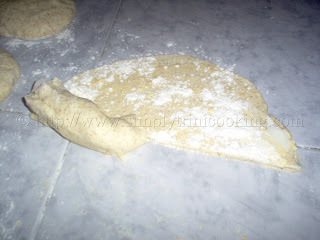 You can alternatively, wrap the roti in a clean cloth and beat with you hands or bailna. Note: Arrival Day – Holiday, better known as Indian Arrival Day celebrates the arrival of the first East Indians to Trinidad and Tobago. It is celebrated on the 30th of May. This has been a really wonderful post, I feel happy to share this recipe with everyone. please come again. If you’re up to it and you really like my Buss Up Shut recipe why not leave a comment in the box below. Looks pretty good! That step where you make a cone of the dough and then press it down – what is the purpose? Similar to flaky pastry, this step helps to fold the butter into the dough completely; it makes it easier to flake apart, when it is mashed up in the final step. You can but only up to 45 mins. How long do you knead the flour? I think I kneaded my dough for too long.. it was pretty stretchy. oh man, this looks fantastic. 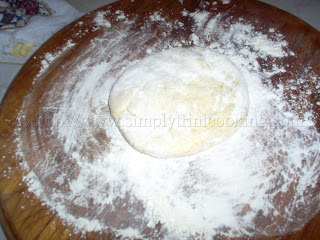 i love roti, and our trinidadian friend used to feed me up with it after my babies were born. love your explanations, too. thanks so much! I am soo happy to have stumble upon your site. What started out as a search for dhal puri roti recipe, ended up with your awesome blog. I love your step by step and I am going to try every one of your recipes (ingredients permitting) “I’m in heaven” as Frank Sinatra says. P.s. I live in Canada I’m seriously deprived of Caribbean soul food. I look forward to more of your delish morsels. Thank you so much for this recipe! I just did a google search for “buss up” and came across your blog! My husband is from Trinidad and I have learned much from his mother, but I am not able to see her enough to learn all I would like to. (We live in NY.) When she was last here, I learned to make dal puri (spelling?) The dal puri is good, but it’s a lot of work, and I like the buss up much better anyway. My husband doesn’t care which – just wants some food like home! 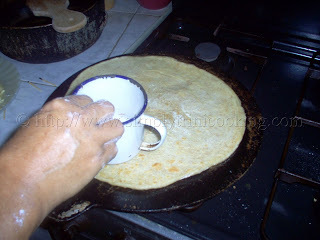 🙂 This recipe came out great for me but I had a little trouble rolling the roti out once I added the butter and did the “cone” step. I served it with curry chicken and potatoes. My husband was excited to get some roti and he enjoyed it a lot. Your blog is my new secret in the kitchen! Thank you again!! Well Mrs wishfuleyes I am glad that the roti came out superbly. This blog, I might add, is my labour of love and the journey has now started. I have a long way to go. Thank you for your support. Without comments like yours and many others I would not be where I am today. Thank you once again and do pass by often for more Trini recipes. I’m glad you’re enjoying my posts. I did the Aloo pies already and it is in the Menu on the right column under Breads and Pastries. As for the Arepas I haven’t done those as yet but it’s in the plans for this year so look out for it. The recipe for the pastelles is very flexible and the olives could be omitted because they are optional. I personally do not like the optional ingredients in my pastelle; I like mine simple and traditional, so go ahead, make those pastelles and enjoy a few. Thanks so much for the recipes. I wish you could make Youtube videos that would be super super great. I am using youtube to learn how to cook but there are hardly any carribean recipes and all the roti recipes are from India, they make there’s different than Trini’s. Please consider it. Please. Youtube! Now that’s a great idea. I will consider it. Thanks. Thank you sooo much for this recipe! After we got married my husband migrated from Trindad to be with me. I was feeling some Trini vibes this week so I made pelau on Monday then I said why not try some buss up shut on Tuesday. It was great. Your step by step instructions made it so easy. I made it with curry chicken, potatoes and pumpkin. The internet was down so I couldn’t find how to make curry mangoes. But my husband was really happy to get some Trini food. He was oohing and aahing about how good it was. He thought I got it from a Trini friend! Well, he was right – you are definitely a friend of mine now. I’m so excited I think I’m cooking callalloo tomorrow! Thank you for your wonderful comment. I did a few vegetarian dishes already, the most popular so far has been Trini Spinach Lasagna. You should check it out. Oh! It’s combined with the ghee and then you use the cup to press it on the roti. Some people use the straight ghee, others, like my mom, like to mix it. Hope this helps. I think T meant substituting the flour for the crushed chick peas or chick pea flour, I was wondering the same thing, and also can you add turmeric or curry powder to give it color, if so whats best and how much? I’m not aware of what you’re referring to but it sounds more like dhal puri to me where we use split peas as a filling. Please elaborate. Ah does love me bus up shut, I rub in olive oil instead of butter. Wish I could get the dablas here in UK to bus it up…..My problem is I can never get the heat under the tawa correct…its either too low or too high…. How long do you leave it to rest? i believe 30 minutes. maybe i need to knead it more? Probably, but remember to leave it to rest for another 30 minutes after you make the “cone”. It should be good by then. so it matters how thick or thin i roll it out. usually i try to roll it thin, is that wrong? i’m going to try to find a tawah or steal my mothers…lol and see if that helps. 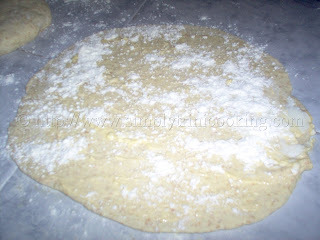 My mother makes the best roti and she showed me how but i’m still trying to get it as soft and flaky as she does it. I am a SA Indian who CAN NOT make roti (indian breads) to save my life 🙂 My husband to be is non indian and can BUT the big problem is…it always comes out stiff. He gets upset and feels terrible. Thank you for your recipes. I am first generation of my Trini family to be born in America. I lost my mother and grandmother seven years ago, which left a large empty space in my heart. Your recipes help me to keep those happy memories I have of them alive, especially during the holidays when we would all be in kitchen cooking. Thanks again for making this AMERICAN BOOP feel at home. 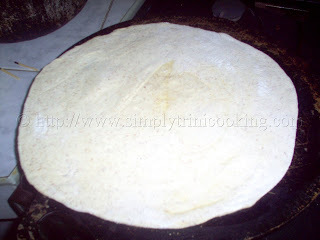 Ok I tried the recipe and the Roti turned out a bit heavy and certain parts were crispy…what did I do wrong? You’ll have to explain all that you did. I used butter instead of ghee and rolled the dough out until it was thin and stretchy, could this be the reason? It could possibly be the heat from the tawah together with how thin you rolled it out. If the tawah was too hot, the roti would have cooked too fast or got over cooked causing the crispiness. I’m still wondering about the heaviness though. care to elaborate? Thanks for the explanation above,next time I’ll lower the heat. Well when I say heavy, it seemed that when the heat was applied the dough thickened and so while I know roti to be light and flaky, mine came out flaky but not light, it was very close to very thin pita bread. Not sure if this explanation helps. my roti came out heavy and cripsy too. i used a griddle to make my roti. 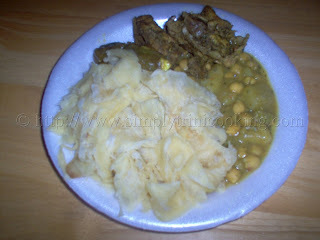 what temp should i put the stove to cook my roti correctly??? Man you just saved my life. I made some dhal puri for hubby and he laughed me to scorn. He said it is no buss up shut. So thanks to your wonderful post I can fulfill his wish. Love the step by step instructions. I don’t have a tawah, what can I use? What is the oil for? To prevent the roti from sticking to the tawah. 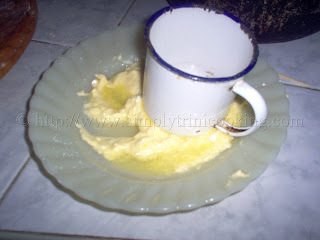 It is mixed with the ghee sometimes or used by itself. Best cooking blog ever. So glad I stumbled upon it….Tried buss up shot for the first time and it came out bessss…. Hi, I really love your blog. You have some really good things going on here. I need a tawa- my problem is that there are so many out there to choose from. Help- should I go the stone route?? What we use in Trini Cooking is the metal type. Hi there. I know I need to practice more, but it seems mine always comes out fat and crispy, not thin, soft, and flaky. My mom brought me a tawa from Trini recently. How thin should I roll it, and what temp should the burner be on? Also, how long does the dough need to sit on the tawa before flipping it over? I think that’s where my problems lie (the rolling out and knowing how to handle it on the tawa). 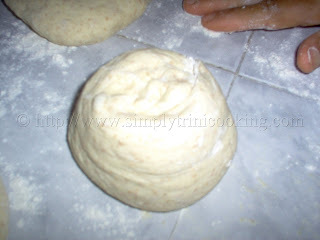 Making roti requires practice so don’t give up. 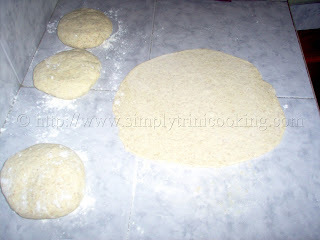 The roti should be rolled out to about 1/8 of an inch. The fire should not be too hot. When you see bubbles starting to appear then you flip the roti. Love the site – I skimmed through a lot of your recipes to see if I am target with my cooking- just to realize how much I really don’t know or even heard about- need to get some rou cou though – ketchup is a bit to sweet – think the rou cou will make a good substitute.